Hard not to hear about what the whole financial world talks about those days: the end of the peg between the Swiss franc and the euro announced by the Swiss National Bank (SNB). Strong reactions were heard in both Swiss and international medias, this decision is a « tsunami », said Nick Hayek, CEO at Swatch group, and is even « worse than the 9th of February referendum », said Jérôme Schupp, Head of Research at Syz & Co. Those words reflect the atmosphere of anger and misunderstanding prevailing in industrial and financial industries. But others managed to control their words and even keep a certain sense of humour, like the two traders from investir.ch who published a death notice of the Swiss peg. 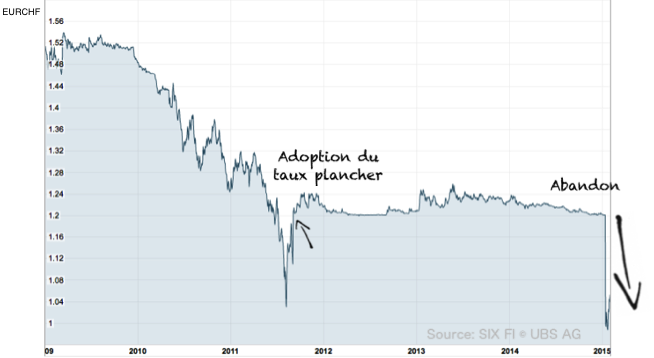 15th of January 2015, 10:28, the SNB announces that it won’t defend the minimum exchange rate anymore. Earthquake on the markets! The Swiss franc gains more than 15%, which implies immediate consequences for every investor gambling for the opposite. Many forex-trading firms suffered bloody losses. Strong reactions from chief executives and politicians were heard in Switzerland and abroad. We even saw on social networks the hashtag #JeSuisCHF ironically used in reference to the famous #JeSuisCharlie. No one expected the SNB to abandon the minimum exchange rate, as Jean-Pierre Danthine, Vice-president of the monetary institution, said a few days earlier on a Swiss TV-show that this policy was the “pillar of [their] monetary policy”. However, even if a lack of good communication is reproached, the SNB couldn’t do otherwise, the surprise was necessary. If any doubt concerning the defence of the peg were known, speculators – seeking an opportunity of profit – would have tried to test it. If the SNB had abandoned it after a speculative attack, the consequences for its credibility would have been disastrous. As the official press release says, the overvaluation of the Swiss franc “has decreased as a whole” and the economy had enough time to “adjust to the new situation”. But some experts are not convinced by the official explanation. Neither Paul Krugman, saying “[…] nobody I know believes the official explanation, […]”, nor Simon Wren-Lewis for whom “This is not that convincing”, are satisfied by the words of the central bank. The pressure on the Swiss franc had intensified itself since the end of the year 2014. 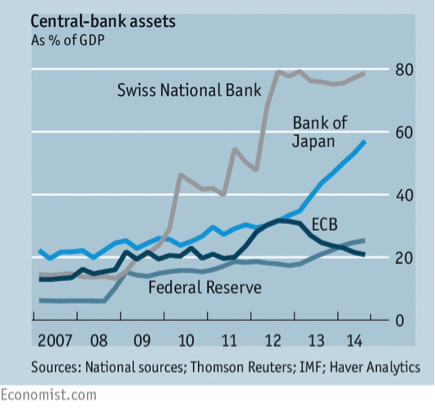 The SNB had to massively increase its purchases of euros in order to defend the peg. The perspective of a massive asset purchase program – the famous quantitative easing (QE) – launched by the European Central Bank (ECB) would force the SNB to massively intervene to peg the franc to a depreciating euro. In the United-States the opposite is expected, a tightening of the FED’s monetary policy by a raise in the interest rates, implying an appreciation of the dollar. Therefore, the euro and the dollar are going in opposite directions, which leaves the SNB in a difficult situation. Therefore, it judged unjustified to maintain the peg, a policy that it always considered as temporary and exceptional. It feels like Switzerland’s monetary independence was gained under constraint. The consequences are expected to be important, even abroad from Switzerland considering the French communes that contracted loans in Swiss francs seeing their debt exploding, or the polish citizens with Swiss franc mortgages, some are now in danger of insolvability. Swiss export industries hit by this “tsunami”, like the watch industry or machine producers, are seeing their competitiveness strongly decreasing, having to sell products abroad at a price 15% higher. Tourism will also be hit. Many tourists will now hesitate to spend their vacations in Switzerland, as the costs highly increased. Switzerland is now at the first place of the Big Mac index published by The Economist, with the most expensive Big Mac of the world at $7.54, but $6.38 one week earlier. The Swiss consumer seems to be the only winner, as all products coming from the Euro Zone are now theoretically 15% cheaper. But this price decrease of the imported goods may have negative consequences; strong deflationary pressures will now appear, reinforced by cheaper oil. 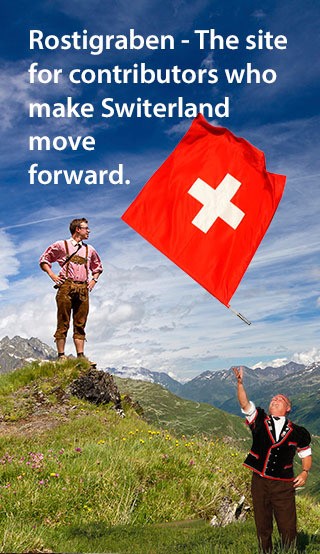 Switzerland was already in a deflationary situation, but without trouble, until today. The main Swiss economic forecast institutions have revised their growth forecasts after the SNB’s decision. The KOF Swiss Economic Institute, after revision, expects the gross domestic product (GDP) to fall by 0.5% as a whole in 2015 and to remain stagnant in 2016. The inflation should fall below zero with -1.5 for 2015 and -0.4 for the next year. It seems like the previous success of the Swiss economy vanished. A broad analysis proposed by par Dean Baker, co-director of the Center for Economic Policy Research (CEPR), explains that the Swiss franc’s appreciation – added to the European QE – will strengthen European exporters and therefore if his main commercial partners are healthier, Switzerland should recover faster. The SNB itself suffered from its decision with a loss of dozens of billions of francs on his foreign currencies positions. Less than one week after announcing the distribution of CHF 1 billion to the Confederation and the cantons, expectations of profit distribution for 2015 are less exciting. Such a loss may appear dangerous at first sight but the main role of a central bank is not to make profit; its balance sheet is a macroeconomic tool used in order to achieve its goal – not to generate profit. Furthermore, a central bank can theoretically not go bankrupt. It owns a magic monetary stick called money printing. This tool may have permitted the SNB to keep the minimum exchange rate indefinitely, buying euros with fresh printed Swiss francs, but the pressure due to the size of its balance sheet may have become too strong. SNB’s decision cannot be considered as an error but the timing can be discussed. Philippe Bacchetta, Professor at HEC Lausanne, says that the decision should have been taken earlier. The SNB seems to have acted under constraint but this impression would have been weaker if the decision had been taken before it had to intervene on the markets at the end of the year 2014. Charles Wyplosz, Professor at the Graduate Institute at Geneva, argues that the central bank could and should have waited and followed the euro’s depreciation. This would have lead inflation in positive territory and therefore weakened the risk of deflation in Switzerland. These events remind us how hard it is for a central bank to fight against deflation. Simon Cox, from BNY Mellon Investment Management, says that it is not the capacity of the SNB to fight against inflation that was hit, but its ability to create inflation. The first step made by the political power is the activation of compensation in case of diminishing working time. The federal minister Johan Schneider-Ammann explains that this measure is made to weaken the impact on employment. Instead of firing them, firms will be able to diminish the working time of their employees who will get compensations from the unemployment insurance. The strong reactions heard after this event seem to be exaggerated. This announcement had the impact of a bomb for our export industries, which may have considered a temporary measure as permanent. Switzerland is living an exceptional economic situation compared to its direct neighbours. Even if the country may get into a short recession, we won’t live an economic disaster as some said. It is important to wait a few months before judging the situation. Before answering the questions “Can Switzerland recover?” we may ask ourselves if we are facing a lethal fall or a hard but temporary period.